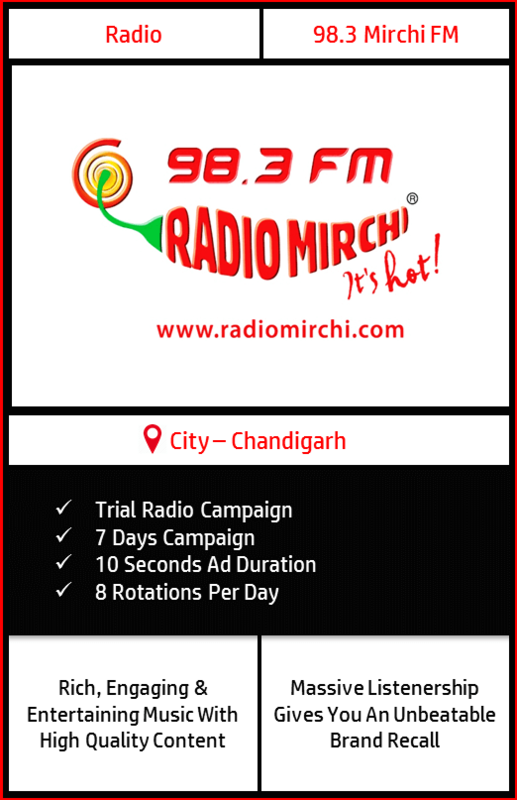 Advertising Medium – Radio Advertising On 98.3 Radio Mirchi, Chandigarh. Low Ad Avoidance as compared to other medias. Radio Mirchi has a strong nation wide presence with 56 stations covering 43 cities. Grand network ensures your brand reaches to the huge masses. The channel comes with a tagline “Mirchi Sun-ne Waale Always Khush” & builds programs catering to Listener’s interest & delight ensuring pure entertainment. 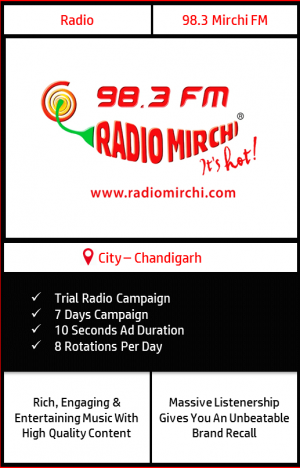 8 rotations of 10 seconds each would be played per day consecutively for 7 days on 98.3 Radio Mirchi, Chandigarh.